(Minghui.org) Audiences in several Swedish towns have had the chance to see the award-winning documentary “Free China: the Courage to Believe” in March 2014. Two screenings were held in the local cinema Filmstaden (Film Town) in Linkoping on March 5 and 6, which were attended by community leaders and many others. Left to right: Amnesty International''s Asa Fahlbeck, New Tang Dynasty (NTD) Television''s Vasilios Zoupounidis and Ilias Kotsamboukidis held a panel discussion after the screening in Linkoping, Sweden on March 5, 2014. Ms. Fahlbeck added that the topic of the documentary was familiar to her, but the movie enriched her knowledge about the practice of organ harvesting in China. For Ms. Fahlbeck, it was very important to follow the stories of Charles Lee and Jennifer Zeng, who were featured in the film and have gone through so much. Particularly striking was the narrative where Jennifer Zeng shared how the labor camp authorities used her feelings toward her family to coerce her to give up her belief. In fact, her daughter initially resented her own mother because of the hate propaganda against Falun Gong. Some called the movie an “eye opener,” while others said that everybody should see it. “I will recommend this movie to all my friends,” said Leo Wijkmark, former Program Director of Konsert och Kongress, Linkoping’s concert hall. 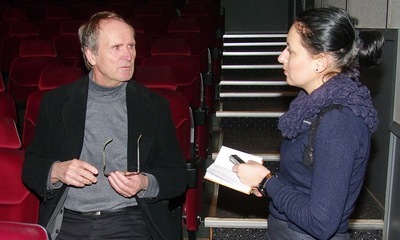 Leo Wijkmark (left), former Program Director of Konsert och Kongress, at the screening in Linkoping on March 5. Mr. Wijkmark said that he was not surprised by what he saw in the movie, and learned that people in China now have more access to uncensored and free information. The screening in Norrkoping took place on March 10, 2014, in the public cinema Cnema. Many people, including politicians and students from different nationalities, asked many questions and engaged in vigorous discussions. One student asked about the reason behind the Chinese Communist Party (CCP) starting the persecution of Falun Gong. A Chinese student who attended the screening explained that the real reason was that the CCP wants people to believe only in it, and does not allow them to believe in anything else. Meanwhile, Falun Gong practitioners did not want their freedom to think and believe to be limited in such a way. There was also a person from Bulgaria, a former communist country, in the audience. She explained how the communist party in her country purged intellectuals and private-business owners on a massive scale after coming to power in 1944, with the aim of eliminating free thinking and taking full control of people’s minds and lives. In Hallsberg, the March 9 screening of “Free China” was organized by local representatives of NTD, one of the partners in producing the documentary. In Laxa, Sweden, the film was shown on March 15, with the support of the local branch of the United Nations.